The Patriots won and are undefeated. 16-0 yesss. Sorry, Peter. At least they gave you an exciting game tonight. You should just become a Patriots fan…it’s a lot more fun on this side…trust me. If you want to scare a guy off, when he asks what you do for work, tell him you write for a relationship and dating website. He’ll say “oh reallyyyyy?,” give you a blank stare, and then slowly walk away. Sas’ blog is public again. She was going through a bit of a blog-identity crisis. She’s one of my bff and I’m not sure how I ever lived without her, so you should read her blog. Seriously. We met in a cute way…through our ex-bfs who are no longer friends. We thank God for eachother every day. We bonded as we watched the ex’s play hockey and then we continued to travel to every one of their college hockey games (because we were amazingly good girlfriends). Now we have our own fun and avoid hockey at every cost. It’s a dumb sport anyway. I love that she was skeptical about being friends with me when she heard where I went to grad school (it’s a majorly artsy school) and now she wants to go there herself. I’m sure she’ll get in…yay! It’s my roommate’s birthday and she’s another one of my bff. I feel bad we had to watch the Pats on her birthday. And then go to the BHP, which might be one of the least classiest bars in Boston. But we’re eating cake tomorrow. Party Favors=best cake in the world. And I’m thrilled to have another bff be 25 with me…it’s lonely being so old. We bought really cute New Year’s dresses this afternoon and then spent the rest of the day justifying the ridiculous amounts of money we spent (we’ll look cute!!!). As an unemployed person (Chelsee hates when I say that as I do have a job….it’s freelance though and I don’t count it, though it is full-time), I have no biznass buying designer dresses. Pictures will be posted after the party, which is at another not so classy bar. We may be the dressiest people there…but oh well. Not sure how I linked all this…it’s been a long night….I’m a little tipsy…and ready to pass out. Sweet dreams! Back in Boston and dead tired, so I’m just going to leave you with my favorite poem from Charlie Smith. I first discovered this poem Junior year in college when I read it in an excerpt in Lorrie Moore’s Birds of America (such a good book!). The excerpted part (I’ve bolded it below) was so powerful to me, especially with stuff I was going through at the time. I am not really a big poetry person as I often have little patience for it, but sometimes I read a poem that really gets me, and this is one. I think everyone can get something out of this poem…at least realize that it’s never too late to be what you want to be. Ohhh I love being sentimental. one more cracked rendition of your singular, aspirant song. Perfect, right? Bed now. Busy weekend. Celebrating the roomie’s birthday tomorrow night with dinner and going out (and watching the Pats game somewhere of course. Can you say undefeated season??? I know Peter can). And of course, New Years on Monday. Trying to find a cute outfit to wear and catch up on missed work somewhere in between. P.S. used the new blender tonight and made deliciousss smoothies (with vodka obvi). Have a feeling it will be getting a lot of use in the upcoming year!! in case you’re looking for somewhere to eat. Just got back from The Met Club where I once again had an AMAZING meal. I’ve seriously never had a bad experience there and will go back again and again (as long as my aunt keeps taking me…uhh I do not come close to affording dinner there). And I highly recommend it to anyone in the Boston area (it’s on route 9 in Chestnut Hill). The employees are also super friendly, which could partly be because they know my aunt, she’s in there so much (um, the waitress followed us out thanking us over and over for the tip). My pseudo aunt is seriously the most lovely, generous person I know. Just an example: she and her husband have 4 seats for season tickets to the Sox and get this…if she is at the game and the rest of her tickets aren’t being used, she goes up to the highest, worst seats; finds people she thinks look nice (usually a parent and child); and asks them if they want to move down to her seats (which are obviously amazing). She does things like this ALL the time and is without a doubt, one of the most generous, caring, and not flashy people I know. Love her. Along the same lines of eating a lot of food, my friends and I decided that instead of exchanging holiday gifts this year, we would all go out for a nice dinner together. It took forever for us to decide on a restaurant, but someone brought up Masa in the South End and when we looked at a menu, we decided to go for it. So happy we did because it was amazing! Saturday evening, 10 of us (seriously a miracle that all 10 of us were able to go out to dinner on the same night) celebrated the holidays together at Masa. The Southwesternish menu was so extensive that almost all of us got something different. And I think every one of us was pleased with our choices. First of all, the appetizer Sas and I shared was to die for!! If you know me, you know I’m obsessed with anything pumpkin, so when I saw it on the menu I HAD to get it. It was Mexican cinnamon roasted pumpkin and goat cheese quesadilla and was absolutely succulent. It almost tasted like dessert and was perfect for sharing. I want to recreate this as soon as pumpkin season returns. For my meal, I had grilled pasilla rubbed mahi mahi with red chile sesame sauce, mango mint salsa, and crisp plantain polenta cake. Ummm YUM is all I can say (I think I’m really bad at describing food except in terms of yum, omg, wow, to die for, uhhhhh, etc. Need to work on that). The only thing I didn’t like about the restaurant is that it was so dark I could barely see my food, which I think was presented really nicely on the plate. Sometimes it can be sketchy eating something you can’t really see, but everything about this dish was so good it didn’t even matter. The flavors melded so well and I think I ate every bit of it. The prices are very reasonable too. And they have really good drinks. I stuck to the Malbec, but Sas and Chels got yummy-looking drinks (sangria margaritas?? Is that right? I remember a cinnamon stick in Sas’ though I’m not sure why). The chef also brought us some complimentary stuff. Some sort of appetizer, which was delish, though I couldn’t see it so I have no clue what it was. They even made Chels a special one since it had nuts on it and she’s allergic (good thing she was smart enough to ask!). They also brought us complimentary coconut macroons for dessert. A sign of a good restauraunt! Also a sign of a good restaurant: when we split appetizers, they split them for us and brought us our own plates. Masa=really good restaurant. So, yes, if you live in Boston or are visiting Boston, these two restaurants have very strong recommendations from me! I cannot wait to go back to Masa and try something else on the menu. I now need to go on a post-holiday diet as I have been eating WAY too much good food lately. I also decided I need to return to my apartment as soon as possible because my parents are way too amazing of cooks and I have spent this entire week eating. I’m now going on a diet of smoothies in my new blender and veggies sliced with my new mandoline. Yesss. Christmas weekend is officially over, but I am still chilling in my hometown, because why not? I’ve got nowhere to be, so I may as well hang out here and get home-cooked meals non-stop and spend quality time with my parents. Plus, I always find a change of environment is good for my work. It’s hard being stuck in my little apartment all day and sometimes I find myself in a bit of a rut just staring at my computer and not getting much done. It’s funny how when I was in college, coming home meant seeing tons of people and being super busy. Now it means not leaving my house at all and seeing no one but family. This is because all of my high school friends who were all over the country for college now live within 5 minutes of me in Boston. So I definitely don’t need to see them when I come home and I can jus spend the quality time with the parents. Christmas was wonderful. It was spending the entire day in my pajamas. I basically sat on the couch and in the kitchen all day chatting with my parents, talking to my sister on the phone, and playing with my new toys. Sometimes it makes me sad that we don’t have crazy relative parties to go to, but mostly I like our peaceful little family Christmases. I’ll save the crazy relative fest for one week during the summer. 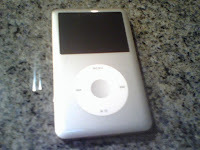 My iPod died a sad death a couple months ago. I got it for Christmas 3 years ago and now I am pretty obsessed with this new one. It’s color! It shows the album covers! It holds 20,000 songs! Yay. I’ve spent endless hours organizing my iTunes library so it looks perfect on my new iPod. My other “replacement” gift. I love my pink North Face a ton, but it’s so dirty and worn, I really needed a new one. I asked for either the white or the light green and my mom chose the light green. My friends will be pleased as they were all “DO NOT get the white one! You will regret it!” They know me too well. I’m sure I’ll do a fine enough job of getting this one nice and dirty anyway. I love it. Yesss! I have wanted a mandoline ever since I tried making sweet potato chips and couldn’t cut the sweet potatoes thin enough or in a uniform enough shape. My dad gave me a lesson on how to use the mandoline last night and now I am super excited to cut up all sorts of vegetables. Wow, I am such a huge loser! I just can’t believe I haven’t had a blender in my apartment. I get SO many cravings for smoothies and now I can satisfy them all. And I will! I totally abused the blender at my ex’s and got obsessed with acai berry and soy yogurt smoothies, but I haven’t had them in sooo long. Blender will also come in handy for alcoholic beverage purposes. Along with a plane ticket to Chicago and travel Boggle (yay! ), my sister got me the best present ever. It’s a Crate and Barrel Cupcake Carrier!! I always have such issues with the transferring of cupcakes when I make them for parties and other gatherings because I have nothing to carry them in (I was starting to get quite creative). This is possibly the best invention ever and will be seeing a lot of use from me! My sister wants me to make cupcakes and carry them with me to Chicago. Hehe. I still haven’t talked about the beginning of the weekend; I got a little off track with the telling of the ex run-in, but there was lots else to say. Like to write about the amazing dinner that was had on Saturday evening. And our fun little trip to the mall on Friday evening. For now I need sleep. Busy day tomorrow, including work, a visit to the neighbors (they are like my grandparents and LOVE to chat for hours), dropping presents off at family friends, running errands, and dinner with my aunt at the Met Club!!! Yay. Hope you all had fabulous holidays too!! Sorry this post was so materialistic. Eeek. I really do believe in the true meaning of the holiday season! So, I wrote a whole really long post and then read it over and realized it sounded WAY too depressing for Christmas Eve. I’ve been a bit emotional lately, what with my sister not being here for Christmas and everything just feeling so different. And running into the ex on Saturday at the bar probably didn’t help. But then again, it actually might have. And when it comes down to it, isn’t that what matters in life? Good people. I have so many good people in my life. I have parents who do everything in their power to make sure I’m constantly happy, whether it’s picking me up in Boston so I don’t have to take the train home, cooking me meals and waiting on me hand and foot, or hugging me every chance they get. I also have a big sister who, no matter where she is and who she’s with and how difficult it is for me to understand her, I know loves me and wants the world for me. And I have the most genuine friends who have been with me through thick and thin and who reassure me, stand by me, and comfort me at all times. So, even though Christmas is going to feel different this year, I think it will be good. I have so much to be thankful for this holiday season, and no matter where everyone is or how sad I am that things are changing, I know we all love each other and just want each other to be happy. And Christmas alone with my parents means I’m going to get spoiled like crazy. I guess I can deal with that; though I would trade in every single present under the tree to have my sister run into my room and wake me up in the morning.